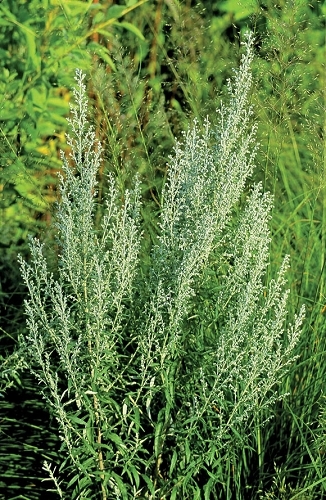 White sage has aromatic, silvery foliage and rather inconspicuous small flowers. It can spread aggressively in certain situations. This makes it unsuitable for small, formal flower beds. However, it is a tough plant that provides attractive foliage and could serve as a taller ground cover in sunny, dry areas. People have found many uses for white sage. Medicinally, it has been used to treat stomach troubles, nosebleeds, headaches, eczema, sore throats, and difficulty in childbirth. It has also been burned as incense, used for roofing houses, and flavoring meat. The essential oils from Artemisia species are powerful. It is wind-pollinated and could potentially aggravate allergies. It is usually avoided by deer and rabbits.